Did I mention that we had Tony “back in Black,” so to speak ... And if dots were goals ... (get it?) ... (well if you didn't, he got three of them) ... And the rest of the game? Did the Jags avenge their loss in the Finals? Nope. The final was not much different than the last time. Attendance (players): DiPierro, Farkas, Gucci, LeMatty, McLaughlin, Newcomb, Nicolosi, Serkin, Baio (sub), Toscano (sub). Net: Harris. Scoring: 1st period: 1-1 tie: Goal by Toscano (Serkin), SHG. 3rd period: 6-1 Pirates: Goals by Toscano (Nicolosi); Newcomb (Serkin, Toscano); LeMatty (Farkas); Toscano (Nicolosi, Newcomb); Nicolosi (Toscano). Say what you will, but James Cameron's “Avatar” has nothing on this 1945 Disney animated short. 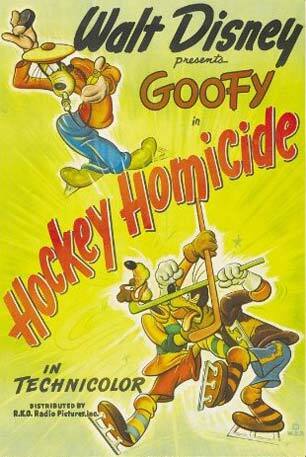 In “Hockey Homicide,” the Loose Leafs battle the Ant Eaters for the Championship. Best movie quote? “Here come Bertino and Ferguson out of the penalty box ... and there go Bertino and Ferguson back in the penalty box.” Sounds like a typical Pirate game. For a nice goal after the (in)famous fight/glove-throwing incident in our zone. For great hustle and the 2-point effort.